Find new cars, trucks, SUVs, and crossovers for sale with our selection for a Shopping App of the Month. 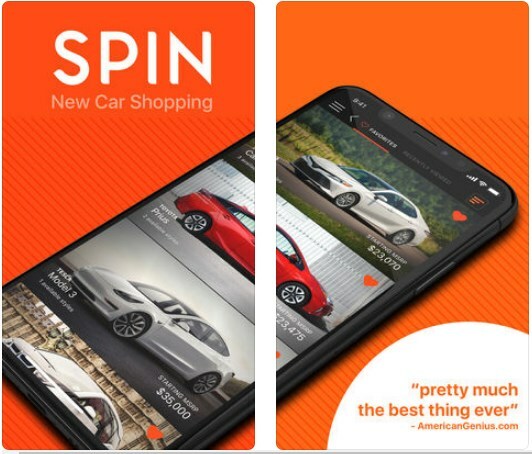 SPIN is an awesome platform where users can come to discover new cars that are on sale, to compare, build and buy with an ease. Let’s see what the app is all about and why we loved it so much! Developer for IOS users, easy to use and highly helpful this car buying app helps users to easily and quickly, directly from their phone find cars, SUVs, trucks and crossovers for sale. With the help of the app users will find the best car depending on their taste and preferences, getting complete information and details they need. On the app users are able to research new models, build and view pricing, save favorites, and compare prices to find the right vehicle. When the user chooses he can use the app for contacting auto dealers to get prices or to schedule test drive. The app allows its users to find the vehicle they are looking for by giving them a lot of helpful and practical features to use. With the help of the app users are offered to discover new cars depending on their preferences and they can also choose to access any category manually with just a tap on the phone. Depending on the selection that the user chooses the apps displays a list of vehicles that the user may like and that complete suit his taste. Users can also update preferences if they changed their mind about the car they like to buy. On the app users can find available hundreds of models and thousands of configurations and the app is helping them by automatically saving all the vehicles in the app’s recently viewed section and he can view them whenever he wants. With over over 16,000 hand selected images users can see the cars they like from different angles and get information about it easily and also the cars the user likes can be saved in his favorites as well. Users can use the app to learn which cars have safety features and when they choose the car for them with the app they can use the build button to update price and options and get the car dialled before they contact their local auto dealer. Download the app for free on App Store to find the best car at the best prices without much effort!